NOTE DE CATALOGUE: The magnificent emerald jewel of the lost Atocha showcases the largest faceted stone in the group of emerald-setjewels recovered from the shipwreck of the famous Spanish galleon Nuestra Señora de Atocha. Set with a single rectangular step cut emerald measuring approximately 11.00 carats, the gold setting, cast and vigorously chased with strapwork and studded with rosettes, reveals the remarkable skills of the New World goldsmiths. The bezel setting, meticulously burnished, secures the stone at the girdle with gold extending up and into the crown of the gem, sealing it firmly in its setting. Although seawater seems to have seeped in behind the stone, it has remained secure for centuries. This impressive emerald exhibits characteristics similar to those mined in the Chivor region of Colombia high up in the Andes. Emerald deposits were discovered there by conquistadors in 1537 and mined by the indigenous people, who were enslaved by the Spanish explorers. Until the discovery of the Chivor deposits, the only emerald mines known to the Western world were those in Egypt, in use since the late 4th century B.C. and largely exhausted by the 16th century. Spanish jewelry design of the 16th century fell under the influence of the Counter-Reformation movement which had sweeping, largely reactionary, social and cultural effects in heavily Catholic Spain. Personal ornamentation of a religious nature was viewed as an outward reflection of inner devotion, and thus permissible even in that austere climate. Jewelers also designed secular pieces like the present lot to display some of the largest and finest gems, which were suddenly available in large supply from the New World mines. 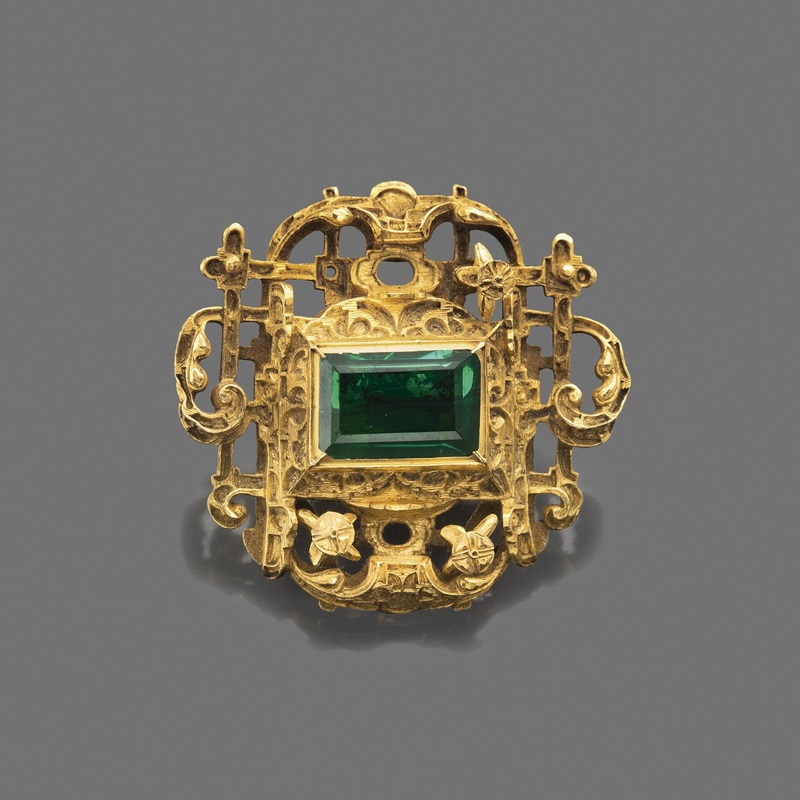 The remarkable availability of fine emeralds from mines under Spain’s control afforded their extensive use in jewelry during the Renaissance. Portraits of the Spanish royal family and the nobility show the sitters bejeweled, and often with gem-set gold appliques sewn directly onto their garments. The present jewel may well have been used for this purpose, indicated by the two eyes on the reverse of the gold setting, as seen in the image above. A portrait of the Infanta Isabella Clara Eugenia by Alonso Sanchez Coello painted in 1578 and now in the Museo del Prado (fig. 1) illustrates this custom of applying luxurious jewels to rich fabrics. With Spain's power at its height under King Philip III and its territory increasing under his successor Philip IV, passengers and crews sailed with greater frequency over the Atlantic, hungry for the treasures of the New World. The Atocha and the Santa Margarita were new additions to the Tierra Firma armada of 28 ships which sailed annually between Spain and the West Indies, carrying European manufactured goods, wine, lumber, iron, cloth and mercury, which they would trade in the Caribbean ports for bullion, animal hides, cocoa, indigo, cochineal, and tobacco. The Atocha was commissioned by the Casa de Contractación, a Spanish government agency which attempted to regulate Spanish exploration and colonization efforts, and was named for Our Lady of Atocha, whose shrine in Madrid was regularly visited by Spanish kings. The ship was constructed in Cuba and, after ill-fated attempts to depart the shipyard which necessitated repairs, she finally crossed the Atlantic and arrived in Spain late in 1620. The Atocha sustained leaks in her bow and once they were repaired, she joined the Tierra Firma fleet and departed Spain for the West Indies on March 23, 1622. In Cartagena, Colombia and Portobelo, Panama, the galleon was loaded with the belongings of the noble families and other passengers making the return journey to Spain with the armada. There was also bullion, tobacco and emeralds, both uncut stones and gems set in gold jewelry such as the present example, many not included on the ship’s manifest to avoid the Spanish quinto tax. These armadas were under the constant threat of English and Dutch fleets as well as pirates. Spanish galleons including the Atocha were armed to defend themselves and the treasure that they carried, but only good timing and an element of luck would protect them against the fierce hurricanes that ravaged the Atlantic. The fleet set sail for Spain with goods and passengers on September 4, 1622 in the midst of hurricane season. Both the Atocha and the Santa Margarita only sailed as far as the Florida Keys before they hit a squall and sank along the reefs. Divers attempted to recover the cargo with some success for that of the Santa Margarita, but found few remains of the Atocha before the wreckage of the ships and their contents were swept out to sea where they would lay unrecovered for centuries. In the 1960s Mel Fisher, a diver with an interest in salvaging shipwrecks, began exploring the waters off of Florida searching for Spanish ships lost in the area. By the end of the decade he and his crew set their sights on recovering the Santa Margarita, with which they had quick success, and the more elusive Atocha. It was not until 1985 that Fisher's team uncovered the main hull of the Atocha and its hidden treasure, including silverand gold objects, bullion, scientific instruments, and hundreds of rough cut emeralds and gem-set gold jewelry. Of the items recovered from the shipwrecked galleon, this stunning jewel is one of the most important. The size and quality of the stone combined with the masterful goldsmith's work are evidence that this jewel was made for a person of noble standing in Spanish society. Accompanied by AGL report no. CS 52234 stating that the emerald is of Colombian origin, with no indications of clarity enhancement.